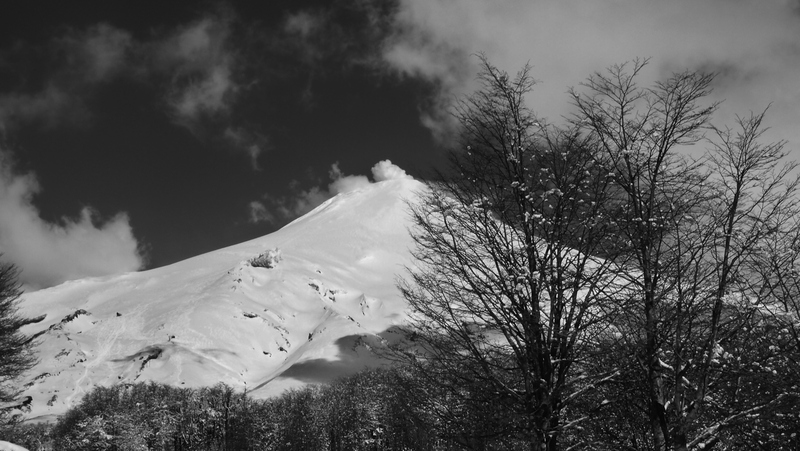 Well the weather finally cleared up leaving 20cm of fresh snow behind on a perfect bluebird day to ski tour on split boards up Volcano Villarrica near Pucon, chile. It is without doubt the most popular volcano to climb, it is pretty straightforward, not easy but not as steep as many of the others. 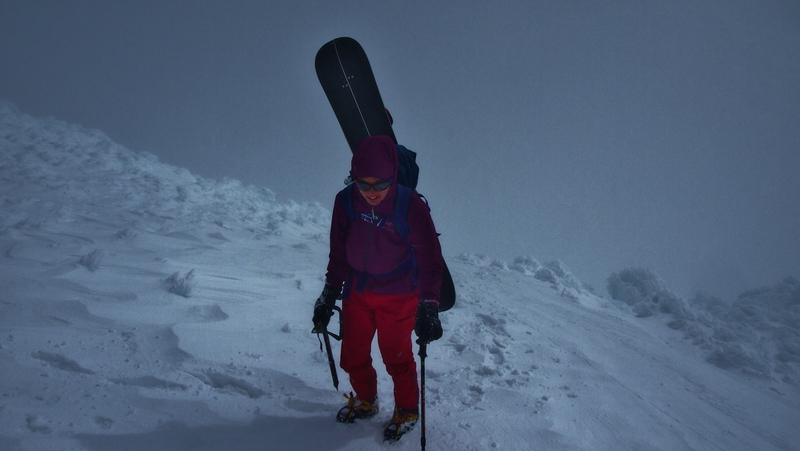 We felt pretty sorry for the few large guided groups who were trudging along walking the whole way in crampons. The slow pace up and more notably the long drag down in this fresh snow meant all but the very fittest and quickest had no chance of reaching the top. Do the guides tell them this in advance? A certain smugness was to be had as we skied up past them, but not as smug as the way down! As seems normal now, we camped up in a random spot, potentially illegally within the national park but just off the access road. The night before a sudden cold snow shower left the lower elevations of the park blanketed in a white dusting, a stunning sunset then illuminated the fresh snow, it was absolutely beautiful. Marion panicked that we would be snowed in by morning, but the van was fine driving up the final slopes to the volcano base. In the carpark we were surprised by the number of people, up until now we had only shared a volcano with one other group. Here there were at least 50 people. Mostly walking, but a few skiers too. We made progress up under the stationary lifts, following an icy ridge up that required crampons. 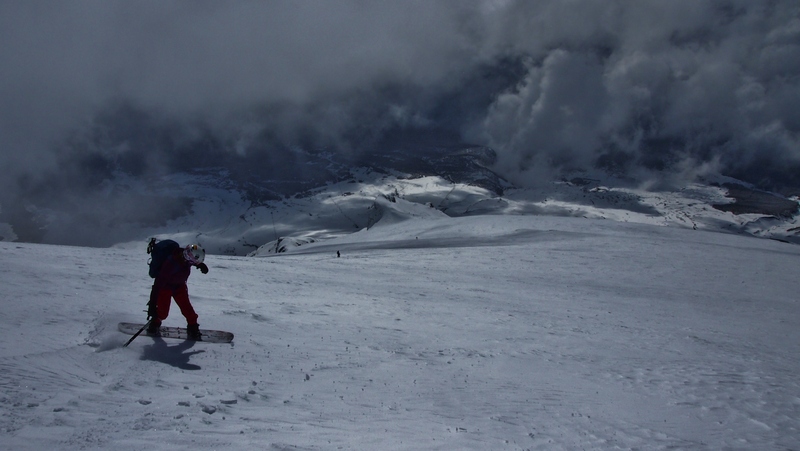 We then hit the main face which was filled with deep powder and a long skin up to the crater edge. The top got progressively more icy with huge ice boulders blocking the path. The picture below is just as it started getting interesting! 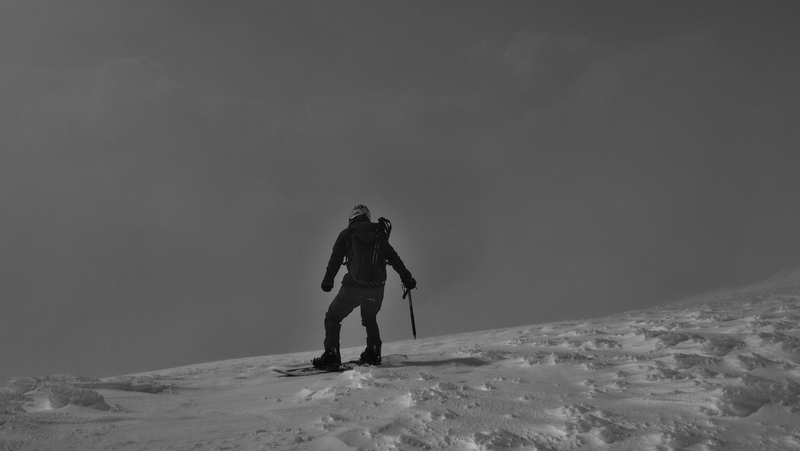 The wind had transformed the snow higher up, but with axes and crampons we climbed onto the crater rim. The view had gone, replaced by whispy cloud and the pluming white sulphuric gases belting into our faces, more than a few minutes in this resulted in light headedness and shortness of breath. As you would agree light headedness is not ideal when on the crater of a active volcano. We traversed upwind of the toxic sulphur, narrowly avoiding a huge melted hole down into the snow, disappearing to goodness knows how deep and probably ending in bubbling magma! It was then time to start down. The initial section from the crater was intimidating as it fell away steeply and was covered in ice. We progressed with ice axes in hand as per above picture, this was to help arrest us if we fell and started to slide a bit. Because on a volcano f you fall the constant slopes mean you just would keep sliding for 1000m plus! It wasn’t long until we found the softer snow lower down, which let us open up and shred the powder laden consistent slopes for the full 1000m odd of descent. With such slopes it messes with your head as a sense of perception for the scale of the drop below is lost. Lower down the trees in the distance were still iced in snow as we reached the natural half pipes of the old lava flows. We raced past the walking groups, who as anticipated had sadly all but one failed to summit. The walk back home must have felt longer for them as skiers whistled past them having the run of their lives….sorry! All together a fairly unforgettable experience in perfect conditions (well a better view from the top might be nice! ).